I’m Steve! I’m just a normal guy that, for whatever reason, God called to serve Him and others by surrendering my life to “the ministry.” I was a member of my home church since 2007, where much of my family has been involved for over 50 years! 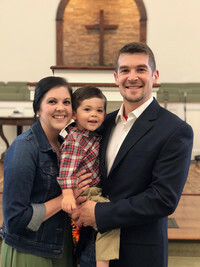 I served as the Youth Pastor from September 2015 – October 2018. Now, God has led my family to Rowland Springs Baptist Church to serve the community around Cartersville! Sherri and I met in August of 2008 and we got married in July, 2011. In May of 2016, God blessed us with our precious little boy, Ethan! Sherri and Ethan are vital parts of the ministry that God has called me to. I am currently attending the New Orleans Baptist Theological Seminary where I am pursuing a Master’s Degree in order to fulfill my calling to become a pastor. I am also a graduate of the greatest university in our country, Louisiana State University! Geaux Tigers! My father was a Marine, and because of that, I have lived all over the country where I have met, and worked with, many wonderful people of all shapes, sizes, backgrounds, and color, which has uniquely equipped me to be able to relate to just about everyone I meet. Being a “pastor” is not something that I do, it’s a part of who I am, and is something that I take very seriously. We love getting to work with the young adults, youth, and children, and are looking forward to serving RSBC!